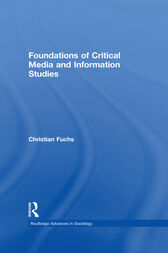 Christian Fuchs is Professor and Chair for Media and Communication Studies at Uppsala University's Department of Informatics and Media Studies. He is also board member of the Unified Theory of Information Research Group (Austria) and editor of tripleC (cognition, communication, co-operation): Journal for a Global Sustainable Information Society. He is author of many publications in the fields ICTs and society, media and society, information society studies, and critical theory.